A powered cellular amplifier connected to your HotSpot, USB Modem or Cellular Router can significantly improve the data speeds and reliability of your wireless Internet device. These amplifiers are widely used in vending machines and ATMs, as well as remote monitoring systems and vehicle monitoring systems. Here is an example of a cellular signal amplifier system in a vending machine. The exterior antenna connects to the antenna booster along with the mobile power booster. The amp is powered and requires a power source such as an AC wall outlet. Cigarette lighter DC power supplies are also available for vehicles. A cellular amplifier system like this connects to USB Cellular Modems, HotSpots and MiFi devices. Systems like this are ideal for smaller areas such as vending machines, but they can work in vehicles and buildings. They can also work with vehicle tracking and monitoring systems and remote monitoring systems such as oil field equipment. Cellular amplifiers are available in 3G and 4G versions. 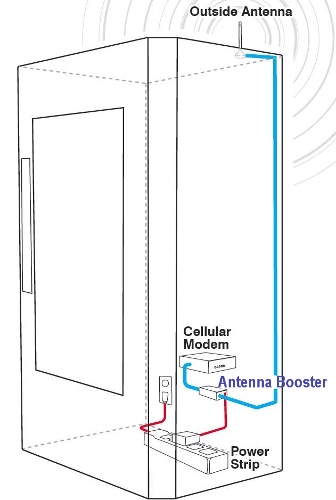 For more information on improving your machine to machine (M2M) cellular signal for Cellular Modems & Router, USB Modems, and Hotspots (MiFi) Devices, see our M2M Signal Booster Information.